Other than the Chevy Volt, 2012 will see the first introduction of commercially produced plug-in hybrid vehicles including the Ford C-MAX Energi, two cars from Fisker, and an actual honest to goodness officially produced Plug-in Prius manufactured by Toyota. The word "electrification" refers to the use of electric drive technology to take over some vehicle propulsion, to gain efficiency over pure-gasoline vehicles. A plug-in hybrid car sits in-between the full electric cars (like the Nissan Leaf or Ford Focus Electric), and the full hybrid cars (like the Toyota Prius). The plug-in hybrid has both a gasoline engine and electric motor, and its battery pack is large enough to drive for a significant electric-only distance, and the car owner has the freedom to plug their car in to recharge without having to go out of their way to stop at a gas station to buy gasoline. Until now the existence of plug-in hybrids has been the result of activists who reverse-engineered the Toyota Prius to develop modifications to convert it into a plug-in Prius. Technically the Chevy Volt is a plug-in hybrid and by rights the Volt should be listed in this article, but GM's insistence on calling it an electric car placed it in the electric car portion of this series. Other than the Volt, no plug-in hybrid has been on the market until now. This is part three of a three part series looking at the electrified vehicles of 2012. Part one is A look at the electric cars coming in 2012. Part two is A look at the electric motorcycles coming in 2012. Toyota Prius plug-in: For years individuals and 3rd parties have been converting their Prius's to have a bigger battery pack for longer EV-only range and the privilege of plugging in. In 2012 Toyota is now acceding to this obvious desire for a Prius you can plug in. This is a Prius with a redesigned system. Like the regular Prius it has a 4 cylinder Atkinson cycle engine, that can operate, through a combined transmission unit, as both to drive the wheels and as a generator to charge the battery pack. Its rated with SULEV emissions (super low emissions vehicle) with AT-PZEV meaning it's a part-time zero emissions vehicle. Total estimated fuel economy is 87+ MPGe, higher than the regular Prius MPG because it can drive up to 12 miles on battery power from the wall socket. Because the battery pack is so small charge time is only 1.5 hours (at 240 volts) or 3 hours at 120 volts. Base price is $32,000 and Toyota expects to begin shipping the Prius Plug-in in March 2012 in 15 launch states. The Prius Plug-in comes with standard features that are options on the regular Prius, hence while the regular Prius base price is $23k the fully decked out Prius Five has a $28k base price. Ford C-Max Energi: These crossover vehicles, the C-MAX Energi and C-MAX Hybrid, are coming to America in late 2012 after a successful run in Europe. The C-MAX Energi is a plug-in hybrid while the C-MAX Hybrid is, well, a Hybrid. Ford boasts the Energi has better fuel economy equivalent in electric mode than the Toyota Prius Plug-in, and an overall 500 mile driving range that's farther than the Chevy Volt. Both C-MAX's feature Ford's powersplit technology that allows electric-only mode at higher speeds than other hybrids, and lets the engine run independently of the wheels to charge the battery. 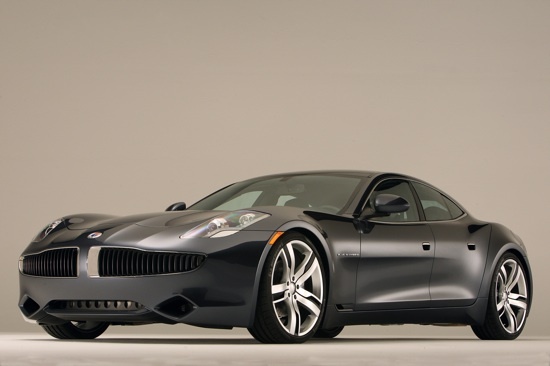 Fisker Karma: This high end luxury sedan by famed car designer Henrik Fisker has curves and elegance galore, and an over $100k base price to match the luxury. One interesting feature is the solar panels in the Karma's roof which Fisker claims will give 200 miles per year of driving range, not a very big benefit in any book. Electric-only driving range is up to 50 miles from a 20 kilowatt-hour battery pack, and top speed is 125 miles/hr. Limited quantities are being delivered now and larger scale production is underway, however we should expect a production pause as Fisker and A123 work through a quality issue on the battery pack. Fisker Surf: The Surf is Fiskers second car design (code named Nina) which Fisker plans to introduce in late 2012 for the 2013 model year. Where the Karma is being built by a contract auto manufacturer, the Surf will be built in the former GM plant in Wilmington Delaware. The Surf is described as being targeted to those with a more active sports-oriented lifestyle, with flexible cargo areas and a certain attitude. The released picture is of a "low slung" car that looks while fast standing still, the tail end has a raised roofline with a tailgate, making the car functionally an old-style station wagon but with sleek beautiful luxurious curves designed by a luxury sports car designer. No word on price or actual availability dates. Via Motors VTRUX: This startup, which counts Bob Lutz (former GM vice-Chairman and "father of the Chevy Volt") on its team, is making a line of plug-in hybrid trucks. The company uses the "extended range electric vehicle" phrase GM created to describe the Volt. The Via Motors XTRUX line uses a series hybrid design where a gas engine/generator is used to charge the battery pack, and there is no mechanical linkage between that engine and the drive train. The electric drive train has a 400 HP electric motor, the 24 kilowatt-hour battery pack delivers a 40 mile range plus "hours of quiet power" for use at a work site. The truck is aimed at workers who are in the field running hand tools, and acts as a portable generator with 150 kilowatt capacity as well as transportation. The truck bed has a 1500 lb payload capacity, and has what Via claims is ample towing capacity. The VTRUX are currently being sold to fleet users, and will be available to the general public in 2013. The company anticipates a $79,000 price tag when manufactured in volume. Part one is A look at the electric cars coming in 2012. Part two is A look at the electric motorcycles coming in 2012. About the reporter: After 22 years in Silicon Valley's software industry David Herron is now writing about green transportation (electric vehicles) from Silicon Valley. He also runs the popular electric vehicle discussion forum, visforvoltage.org, and is the author of the book "Node Web Development". Hybrid cars are currently most wanted car in the automotive industry.it has nice look and well design body.